The competition among Samsung, LG, Apple and other smartwatch makers is expected to intensify this year, industry watchers and analysts said Sunday. Samsung Electronics plans to unveil a new, round smartwatch, codenamed “Orbis,” at the Mobile World Congress (MWC) 2015 which takes place in Barcelona, Spain, next month. Consumers have already applauded the circular displays of the Moto 360 from Motorola and the G Watch R from LG Electronics, so it is no surprise that Samsung has been working on its own round watch, industry insiders said. So far, Samsung’s 3 wrist watches ― the Gear, Gear 2, and Gear S ― were square-shaped, under the strict concept of smart device rather than traditional wrist watch. Orbis is a Latin word that has many meanings including circle. The project name gives a hint that the company’s next model will be circular. LG Display, the leading provider of liquid crystal displays (LCDs), is now preparing an all-out effort to extend its dominance to the new world of digital displays shaped by organic light emitting diodes (OLEDs). The company is to spend 3.8 trillion won (about $3.6 billion) this year on adding facilities and improving technologies with the predominant focus on improving its capabilities for OLED screens, becoming conventional in smaller devices like smartphones and tablets and beginning to appear in larger products like televisions. OLED screens provide a stunning upgrade in picture quality and power consumption compared to conventional LCDs. 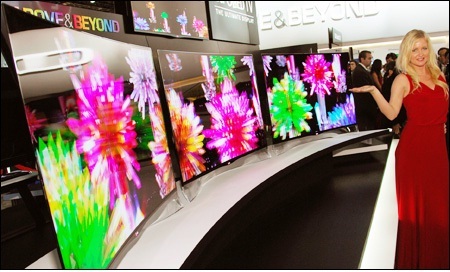 High costs and difficulty in mass production have been slowing their adaption in televisions, but major electronics makers like Samsung Electronics, LG Electronics and Sony believe they will see a breakthrough on this front this year. Amid sharpening technology, there is no doubt that 3D TV is here to stay with the whole industry currently at the same stage as when high-definition (HD) was introduced. 3D was a key issue at the recently finished IFA electronics fair in Berlin where most TV majors displayed their latest 3D solutions with hopes to take the lead in the booming market. “3D will be everywhere next year,’’ said Jim Chabin, president of the International 3D Society. Now, attention is being shifted as to whether latecomer LG will break down the current domestic lead of Samsung. Price matters for 3D hopefuls because there is little 3D-only content on the market and consumers don’t have much knowledge, in general, of viewing differences offered by the different technologies used by Samsung and LG. “That’s why we are confident to completely beat Samsung’s technology in China by the end of this year and our next targets are the United States, Europe and Japan,” said Kwon Young-soo, the chief executive of LG Display, in a meeting with reporters, Thursday. LG Electronics and LG Innotek, the electronics arms of Korean conglomerate LG, said Friday they have agreed to drop all light-emitting diode (LED) patent litigations with Osram GmbH, the LED unit of Siemens AG. As part of the Oct. 31 settlement, the companies also agreed on a license agreement for their LED patent portfolios, settling patent suits filed in countries including Korea, Germany and the United States, the LG affiliates said in a press release. “We are very much satisfied with the settlement reached. It is our long-standing policy to reach license agreements with other manufacturers of LED products,” said Aldo Kamper, chief executive officer of Osram Opto Semiconductors. Anyone who saw Tom Cruise’s “Minority Report” would remember that incredible clear-as-glass screen he used to manipulate images and data. This futuristic display seemed like a distant dream 10 years ago when the movie was released, but in the near future, this dream is about to come true. 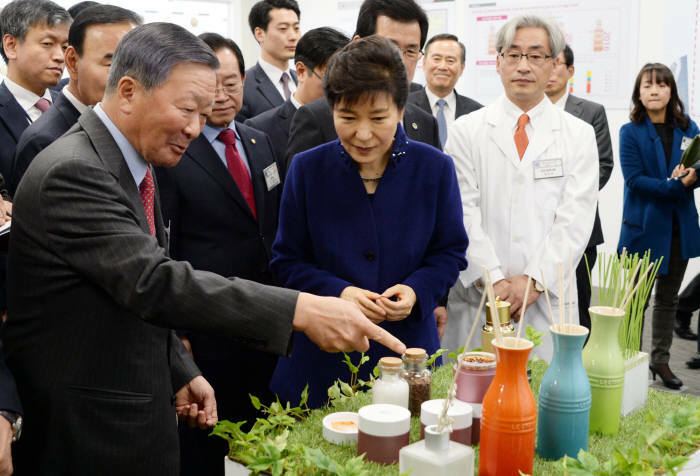 The development of transparent and flexible displays was selected as one of the Future Industrial Technology Development Projects led by the Korean Ministry of Knowledge Economy (MKE)’s Office of Strategic R&D Planning(OSP). The main role of OSP is to develop strategies and guidelines of next year’s budget for the around USD 4.2 billion of MKE’s R&D budget, having a consultation with each department. This time, the Office initiated the Future Industrial Technology Development Projects, selecting and supervising projects which will create future growth engines of Korea. Being comprised of former CEOs or CTOs well-versed in market trends, they are expected to have more sense of responsibility in investing in business. The projects are categorized as fast track or slow track where fast track, referred to as “Creation of Early Outcome” is a short-term project lasting for three years involving conception new of botanical drugs and key system semiconductors for IT convergence. On the other hand, slow track called “Creation of New Market” lasts for five to seven years concentrating on long-term projects such as transparent and flexible display creation, one of the three projects initiated this year, six in total.